Have you ever dreamed of a place where you can get lost in time? Citronella is beautifully carved into the volcanic cliffs 50Ft. 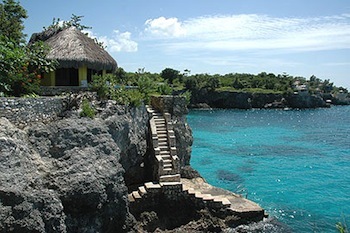 above sea level in Negril, Jamaica. With almost three acres of lush tropical landscape, this property has been kept in the "traditional Jamaican" environment. Citronella offers sea breezes, quiet caves, secluded coves, grottoes, and most of all privacy. Citronella was founded in the early 1970's by it's present owners searching for his paradise and they have created a resort where you can truly get away from it all. Citronella caters to people from all over the world and many are repeat customers who return to Citronella for its location, beauty, and secure atmosphere. Great House open to all guests and where your continental breakfast is served. Now serving breakfast, lunch and dinner at The Great House! The cottages are very private from one another. Cottages are all open-aired with louvered windows, ceiling fans and Mombassa mosquito netting over every bed. Most come with full kitchens. Barbecues available: "There are stand alone grills using charcoal/wood and some are in ground pit style and one large barrel style"
The Round House is their most popular house. Situated at one corner of the property, it offers its own private sea access and sleeps 2 to 4 comfortably. It has a full kitchen and bath and offers a view of the Negril Lighthouse from the veranda that sweeps halfway around the house. Queen bed in loft and 2 single beds down. The sea-grotto shower is a special treat. The Cave House is built into the cliff over the deepest cave on the property. It offers a beautiful veranda, bedroom, living area, and full bath. Perfect for a couple. Sleeps 2 to 4. 1 story open concept with king bed and 2 single beds/coffee maker, toaster & refrigerator only. The Cove House is situated in the middle of the property. It offers its own private sea access and swimming cove. It has a full kitchen, three separate bedrooms, dining and living rooms, a large veranda cliffside with sea view, and sleeps 6 to 8 very comfortably. The bedroom on the main floor has a double. Upstairs bedrooms ( 1 at front and 1 at back, one with a king bed and one with a queen and both have half walls to take advantage of the sea breeze). A single day bed in upstairs hall abnd a full (double) bed downstairs accommodates extra people. Bath with shower, toilet & sink on main and 2 piece bath upstairs). There is also an extra cliffside shower at the sea-access. 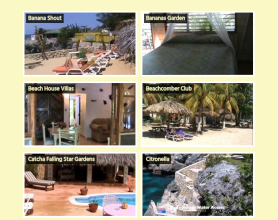 The Conch House is a double bungalow (duplex) or one great house. Double door inside can be opened when whole house rented or locked for privacy. It sleeps 2 to 4 comfortably and has an upstairs loft and outside front veranda. Each side has a double bed down and double bed in loft. Refrigerator, coffee maker and toaster only. It offers its own private sea access. The A Frame, situated at one end of the property, is a private delight. It offers gardens and a private veranda. One double on the main floor and double bed in loft. Sleeps 2 to 4 nicely and has a full kitchen and bath and private water access.